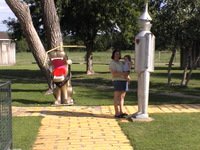 When we made a road trip stop in Wizard of Oz, Kansas, we came away with several photos and the feeling that we had really been to Kansas. No, there's not actually a town named after the movie. 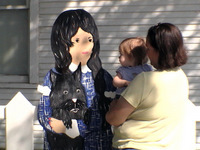 But there is an exhibit in the town of Liberal, Kansas that takes you right to Oz. It's a good stopoff if you have kids or are obsessed with that old movie. Dorothy's house, before the tornado! Here's Dorothy's house. She wasn't home. No, really. 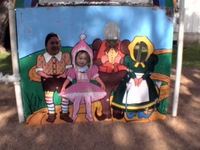 They bring in a girl to dress up as Dorothy and give little tours, but she wasn't there when we visited. It would have been nice to wait around, but we did have at least a vague schedule to keep. 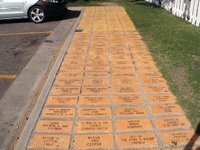 Follow the Yellow Brick Road to get around. This was probably the most important detail of the entire complex. I'd say they nailed it. A Dorothy cut-out. But did she really have jet-black hair? I imagined chestnut. And here, you can actually become the characters from the movie. As you can see, this is a very kid-friendly road trip stop. Wizard of Oz, Kansas, baby! 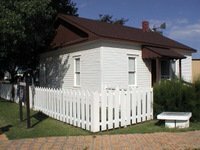 To sum up, if you're driving along U.S. Route 54 in Kansas and are looking for a cheap, low-tech recreational opportunity for the kids, don't miss the Wizard of Oz exhibit in Liberal, Kansas. We also got to watch four pigs fighting in the back of a truck while traffic was stopped on 54....but that's a story for another page.